Wednesday was my last day at work. I thought about going to work as Stana, but I did not. The CEO came to my cube about 10 AM to wish me well and that was my cue to get out of Dodge. I turned in my badge, keys and laptop, went around the building to say goodbye to everyone and drove home. It was all very anti-climatic! So now I was on the fence about going to dinner as Stana. I exchanged emails about my dilemna with Paula and she encouraged me to go as Stana. 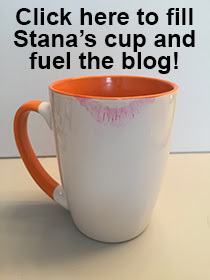 Then I read yesterday's blog post by the always insightful Joanna and the one-two punch from Paula and Joanna pushed me off the fence, so Stana will be dining this evening. It should be interesting. The girls have no idea who will show up, but I know Stana's appearance will not surprise them. I am sure that the guy will be very surprised, just as I am sure that everyone in the company will have their suspicions confirmed Monday morning when the story about our dinner gets out. Who says I lead a boring life! 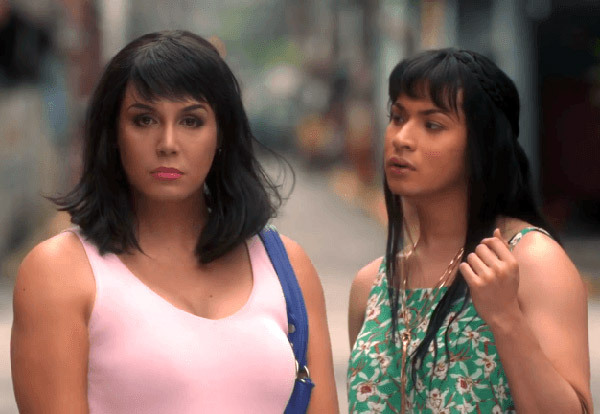 Paolo Ballesteros (left) femulating in the 2016 Filipino film Die Beautiful. In our youth there were a great many sayings that people would drop into conversations where appropriate. The phrase that comes to mind now is that "Today is the first day of the rest of your life". Have a great time and I am sure you will look great. Do it - It is you chance to make a statement. This is who I am! Go with the "really? I thought you knew!" I was all set to use that line - thank you for it. You go, girl! Have a lovely time this evening as a woman with two other women and a gentleman. I expect the conversations will be very interesting and fun! Have a wonderful evening Stana. Maybe he is also a member of the community, and they know you two never knew about each other and would hit it off. Well - it's your life now to do as you want for as long as you are able. This might be for the short life that you have left, just like the rest of us. 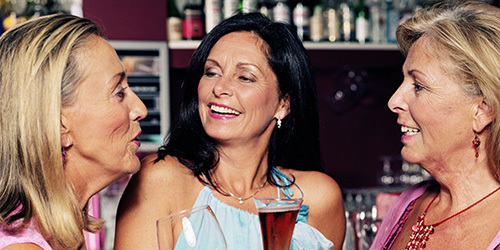 At the age you are, mid sixties, you don't have very long to go. Thirty years at the most and perhaps less than that, twenty, ten, five or maybe just the one? Your ex co-workers are in the same boat and it is sinking with all of you in it. So really, do they care? Probably not and if they do it will probably be to wish they, like you, had the courage to do something they have always wanted to do - but somehow can't or are afraid. Probably something naff like going fishing of Hawaii or scary like skydiving or beautiful like learning the violin. We all lead fearful lives and when someone shows us how not to be afraid we become humbled and ashamed. Children make us feel that way. They have no fear and show us the direction that we are frightened to go. As for how you will dress? Well I would dress down. Be as womanly as possible in the most subtle and feminine way. Wear your best lingerie (for you) and have so much hidden away out of sight that is so feminine. So no pantyhose - stockings and garters under a dress/skirt that will not show off your stocking tops as you so often do in some of the photos that you put on your website. This appearance is NOT a party, Halloween, a fancy dress or for a laugh or a bet. This is serious womanhood, so get the message across and behave as such. Make the man feel so out of place that he will want to give a feeble excuse and make an early departure leaving the girls to be alone together. I am sure you will present beautifully and appropriately, you always do. You have left the Company, you are starting a whole new phase of life, what is the down side of people knowing now, they may kick themselves for their lack of perspicacity, but I am sure they will be happy that you are able to spend more time expressing yourself. Do it! I recently found out I have cancer. Treatment was successful. But it taught me that I was right coming out and expressing my feminine side a decade ago.